Mental illness can refer to conditions such as bipolar disorder, schizophrenia, personality disorders, psychosis and more. Our research shows that there is a real absence of content across the Irish media landscape on severe and enduring mental illnesses. Irish journalists and producers have referenced the lack of clear concise information available on severe mental illnesses, the shortage of people with these conditions willing to engage with the media, and the media’s own long-held misunderstandings about the abilities of people with the conditions. This section aims to clarify much of those misunderstandings and guide journalists in their coverage of severe and enduring mental illnesses. Always include contact details for further sources of information and advice when reporting on mental illness. Avoid trivialising or misusing language that might create public fear, myth, bigotry and distress. ✓ DO use correct terminology. ✘ DON’T write headlines like Psycho on the loose!, Nutter locked up, or use the term schizo to describe the weather. Context: Schizo - Calling the weather, or any changeable activity or action schizophrenic or schizo, doesn’t make sense on any level. Schizophrenia has little to do with changeability or unpredictability. Learn more about Schizophrenia here. Only use the medical terminology to describe someone’s mental illness and only if there has been a medical diagnosis. ✓ Do: Say a person has a condition, e.g. John has schizophrenia, Mary has bipolar disorder. ✘ Don't: Describe people as their illness, e.g. John is schizophrenic, Mary is bipolar. Avoid making a link between mental illness and violence. It has been proven that mental illness is not a future predictor of violence unless it is linked with substance abuse. Research shows people who suffer from mental illness are far more likely to be the victims of violent behaviour rather than be the perpetrators. The majority of mental illnesses do not have violence as a predominant behavioural indicator of that illness. Encourage positive stories about people living with and managing depression, as well as stories of recovery. There are 100,000s of people in Ireland successfully living with different mental illnesses. Their reluctance to engage with the media could be because of previously negative experiences or representations. Contact Headline, or our partners See Change for help sourcing contributors. Avoid making a link between schizophrenia and multiple personality disorder. Never encourage people to change or stop their medication without medical supervision. The taking of medication is based on individual needs and cannot be generalised. The implications of this kind of reporting can be devastating. Consider if mentioning a mental health diagnosis is relevant to the story. 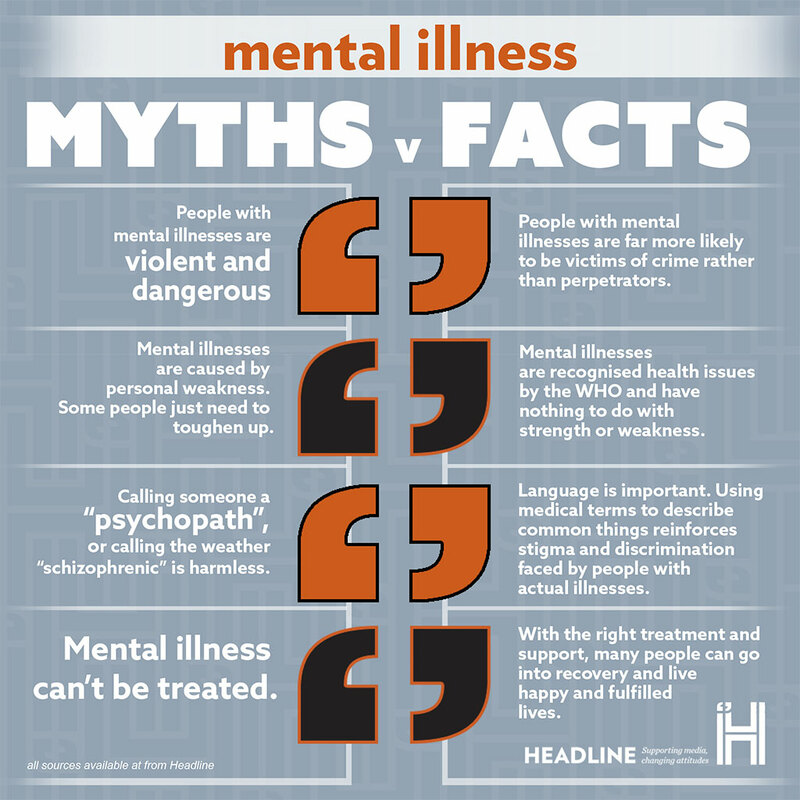 Not everyone wishes to have their mental illness discussed in public so it is important to consider the implications for the person and their family before reporting on a mental illness. Include comments from a mental healthcare professional, an individual living with mental illness, or an organisation specialising in mental health issues. This will ensure that the reporting is accurate and balanced. Does a picture of someone wringing their hands through their hair, or looking sad adequately describe a person with depression? No. Avoid sterotypical images of "sad" people as this does not reflect the realities and complexities of depression or mental illness. There are three types of bipolar disorder; bipolar I, bipolar II, and cyclothymia. People diagnosed with bipolar disorder experience a swing in moods from depression to periods of overactive, excited behaviour known as mania or hypomania. Between these highs and lows, patients often remain stable. Most people will experience a number of episodes, with each lasting three to six months, although some will experience only a single mood episode. Some people also experience psychosis during manic episodes which can include visual or auditory hallucinations, or delusions. Schizophrenia is a serious mental illness characterised by disturbances in a person’s thoughts, perceptions, emotions, and behaviour. Symptoms can include hallucinations, an inability to express emotion, confused thinking, and issues with memory or concentration. A condition featuring symptoms of mood disorders such as depression or bipolar illness, as well as schizophrenia. Like other mental health issues, diagnosis can be complicated. Schizoaffective Disorder’s symptoms overlap with Schizophrenia and other mood disorders. A diagnosis can be changeable. There has been some disagreement about whether Schizoaffective Disorder is best understood as a type of Schizophrenia or a type of mood disorder. About 1 in 200 people develops Schizoaffective Disorder at some time during their life. Schizoaffective Disorder usually begins in late adolescence or early adulthood, often between the ages of 16 and 30. More women than men tend to experience schizoaffective disorder. A group of conditions characterised by ways of thinking and behaving that differ from what would be expected and cause significant difficulties with functioning. People with a personality disorder may find that their beliefs and attitudes are different from those of most other people. Symptoms of personality disorders can include acute discomfort in relationships, distrust of others' motives, distortions in thinking, suicidal behaviour, feelings of inadequacy, or a need for continual reassurance. Also knows as OCD, this is a chronic and common condition associated with obsessive thoughts and compulsive behaviours. An obsession is an unwanted and unpleasant thought, image, or urge that repeatedly enters a person's mind. A compulsion is a repetitive behaviour or mental act that makes a person feel compelled to do in order to avoid or undo the effect of obsession. Unlike the usual use of the word 'obsession' to describe something enjoyable, OCD is unpleasant and frightening. Psychosis is a treatable mental illness which individuals can experience by itself, or as an aspect of schizophrenia, bipolar I, depression, dementia, brain injuries, alcohol misuse, drug misuse, and many other conditions. When a person is going through an episode of psychosis they can experience delusions, hallucinations, or paranoia. These can sometimes lead to the individual isolating themselves from others. Hallucinations occur when someone experiences a sensation such as seeing or hearing something which others do not. Delusions consist of personal beliefs, held with complete conviction, that are true for the individual but seem strange or untrue to others. Not everyone will experience the same symptoms of psychosis. Some people will find an episode of psychosis stressful, while others may not. Early intervention is key to supporting the individual in their recovery, dealing with symptoms, and leading the life they wish. The stigma and discrimination associated with a significant mental illness is, for some people, almost as difficult to manage as the experience of being unwell. While there is more understanding around mental health difficulties like depression and anxiety, conditions such as Bipolar, Schizophrenia, Schizoaffective disorder, personality disorder or OCD remain misunderstood and are heavily stigmatised. This has led to mental illness being associated with derogatory language like ‘Schizo’ or ‘Psycho’ and has created an understanding that mental illness is something to be feared. It is necessary to confront biased social attitudes in order to reduce the discrimination of people who are living with mental illnesses.